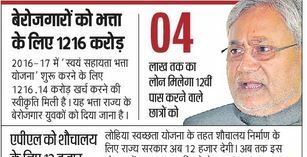 Chief Minister Self Allowance Scheme is a scheme provided by the State Government of Bihar. It is also known as Mukhyamantri Swayam Sahayata Bhatta Yojana. This is a noble initiative taken by the State Government of Bihar and it will provide financial assistance to the unemployed youth so that the unemployed youth would be able to find a job. This scheme is indeed a great step taken by the Bihar Government because often it is seen that the unemployed youths are diverted from the good means due to their unemployment issues. Two schemes are being implemented under Chief Minister Self Allowance Scheme. Their names are given below. Both the schemes are currently being implemented in the Vihar State. This scheme aims to financially assist the unemployed youth of the Vihar State. The State Government of Vihar will be providing an amount of Rs. 1000 per month to the unemployed youth of Vihar during their job search. But the monthly stipend will only be given to the 12th pass youth of the Vihar State. This financial assistance will be provided to an individual for a maximum period of two years. This scheme will solve the problems of the job seekers to a great extent as it will be very useful for them. The transportation and other necessary expenses while searching for a job may be covered with the monthly amount provided by the scheme. Only the educated youth will be eligible for this scheme. Thus, firstly an individual will have to be 12th pass from a state approved board. An individual must have to be looking for jobs. If an individual is willing to pursue their higher studies, they will not be eligible for the facilities of Chief Minister Self Allowance Scheme. There is also an age limit for Mukhyamantri Swayam Sahayata Bhatta Yojana. An individual must be 20-25 years old to be eligible for this scheme. An individual will have to be the permanent resident of the district from where they are applying for the Chief Minister Self Allowance Scheme. The most important criteria for eligibility is that an applicant must not be benefitted from earlier allowances, scholarships or any of the student schemes provided by the State Government of Bihar. If an applicant is being benefitted from education loan or Student Credit Card Scheme, they will not be eligible for this scheme. If an applicant is self-employed they will not be eligible for the Chief Minister Self Allowance Scheme. An applicant will require a certificate under Kaushal Yuva Yojana to be eligible for the facilities of Chief Minister Self Allowance Scheme. This certificate will only be provided to the applicants who have basic knowledge on computer and have basic communication skills. State Government of Bihar will create an online portal so that the applicants are able to apply for Chief Minister Self Allowance Scheme. The applicants will be able to go to the portal and apply for the scheme. All the applications for Mukhyamantri Swayam Sahayata Bhatta Yojana will be invited through online mode. An applicant will be able to use the internet to download the format of the application form of Chief Minister Self Allowance Scheme. An applicant will also be required to attach some mandatory documents along with their application form. The 10th Pass Certificate of the Applicant where the Date of Birth of the applicant is mentioned. Residential Certificate of the applicant. Saving Bank account details of the applicant. (Including IFS code, bank & branch name, address of applicant and account number). Aadhar Card of the Applicant. The Principal Secretary of the transport department in the area, Sanjay Kumar Aggarwal had a meeting with other administrative officers to create awareness about the special scheme that offers monthly financial assistance to people who have the qualification, but have so far failed to bag a suitable job. This grant will offer encouragement to eligible applicants to strive and get an occupational engagement as soon as possible.